If you want to try new wines I recommend you develop a relationship with a bottle shop (unless to travel to various wine regions often). You want a shop that offers a varietal of wines from all over the world. 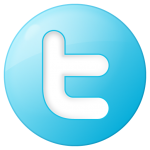 The owner and or employee should be somewhat familiar with wines. If they offer wine tastings and sometimes tastings with the winemaker that is a bonus. If they have a newsletter definitely sign up. A while back we attended a Tent sale at a local bottle shop (Sunfish Cellars). Twice a year they host a huge tasting with many wine reps. When we arrive we get a multi-page tasting sheet of the wines including their sale price (good that day only). The sheet tells you what tables the wines are at. Trust me you want to spit or have a driver. After trying ~15 wines your palate goes flat. So, look at the list and highlight the wines you want to try first. 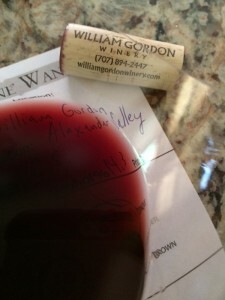 A few years back we had the opportunity to meet Gordon Drake of William Gordon winery at the Tent sale. As you can guess Gordon is one of the owners. An coincidentally another person from Minnesota! Deep color depth with a purple hue. Aromatic, young-fruity with aromas of sweet blueberry, blackberry, cherry. Dry, full-bodied and the acidity was slightly off. My initial sips the wine was tart. The tannins were week. Soft mid-palate flavors with a long finish. Winemakers notes: Aged in French oak for 22 months. 325 cases produced. 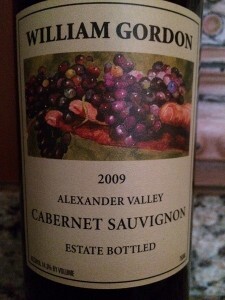 I rated the 2009 William Gordon Alexander Valley Cabernet Sauvignon three glasses. If you find a bottle shop become friends with them, do not be afraid to ask questions and buy wine from them.